This is an extensive revision of the 2007 and 2002 editions of my book chapter, and with some heavy weight-lifting from my new co-author Daniel Wigdor, it treats direct-touch input devices and techniques in much more depth. Lots of great new stuff. The book will be out in early 2012 or so from Taylor & Francis – keep an eye out for it! Alright, here’s another blast from the not-so-distant past: our exploration of combined pen and touch input on the Microsoft Surface. And this project was definitely a blast. A lot of fun and creative people got involved with the project and we just tried tons and tons of ideas, many that were stupid, many that were intriguing but wrong, and many cool ones that didn’t even make our demo reel. And as is clear from the demo reel, we definitely took a design-oriented approach in this work, meaning that we tried multiple possibilities without focusing too much on which was the “best” design in this work. Or, said another way, I would not advocate putting together a system that has all of the gestures that we explored in this work; but you can’t put together a map if you don’t explore the terrain, and this was most definitely a mapping expedition. 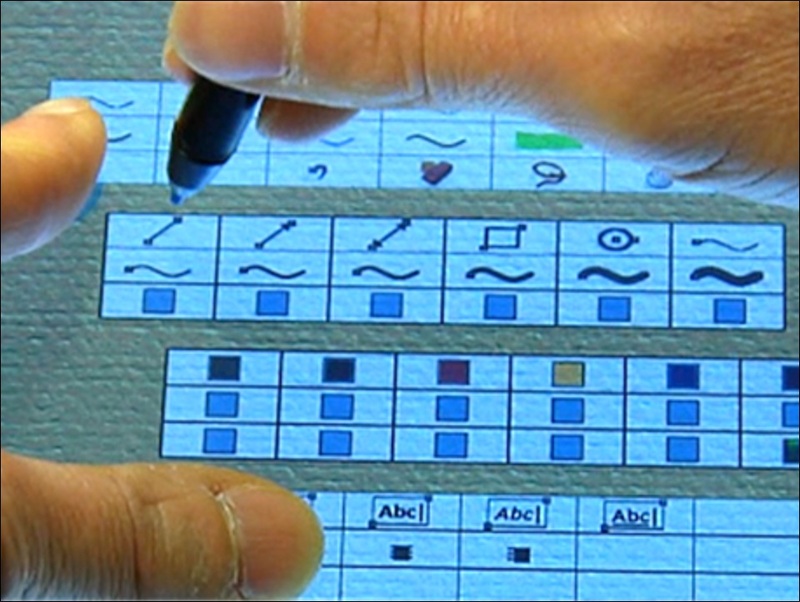 Since I did this original post, I’ve published a more definitive paper on the project called “Pen + Touch = New Tools” which appeared at the ACM UIST 2010 Symposium on User Interface Software and Technology. This is a paper I’m proud of; it really dissects this design space of pen + touch quite nicely. I’ll have to do another post about this work that gets into that next level of design nuances at some point. 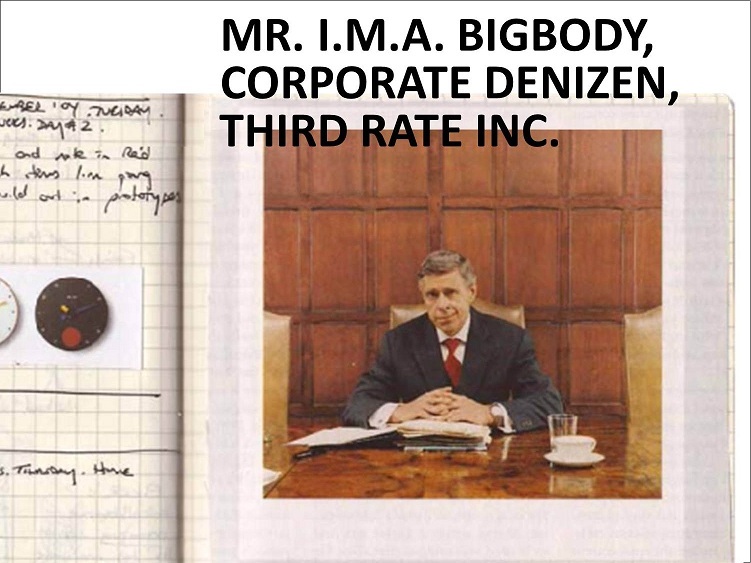 Mr. Bigbody, a Corporate Denizen of Third Rate, Inc., is exactly the sort of arrogant prove-it-to-me, you’re-just-wasting-my-time sort of fellow that seems to inhabit every large organization. Why the pen? I can type faster than I can write. Just tell me which is best, touch or pen. Touch and pen are just new ways to control the mouse, so what’s the big deal? And in the end, of course, because the good guys always win, Mr. Bigbody gets sacked and the world gets to see just how much potential there is in combined Pen + Touch input for the betterment of mankind. One other comment about this work before I turn it over to the classic post. We originally did this work on the Microsoft Surface, because at the time this was the only hardware platform available to us where we could have full multi-touch input while also sensing a pen that we could distinguish as a unique type of contact. This is a critical point. If you can’t tell the pen from any other touch– as is currently a limitation of capacitive multi-touch digitizers such as those used on the iPad– it greatly limits the type of pen + touch interactions that a system can support. These days, though, a number of slates and laptops with pen + touch input are available. The Asus EP121 Windows 7 slate is a noteworthy example; this particular slate contains a Wacom active digitizer for high-quality pen input, and it also includes a second digitizer with two-touch multi-touch input. The really cool thing about it from my perspective is that you can also use Wacom’s multi-touch API’s to support simultaneous pen + touch input on the device. This normally isn’t possible under Windows 7 because Windows turns off touch when the pen comes in range. But it is possible if you use Wacom’s multi-touch API and handle all the touch events yourself, so you can do some cool stuff if you’re willing to work at it. Which gets us back to the Manual Deskterity demo on the Surface. To be honest, the whole theme in the video about the digital drafting table is a bit of a head fake. I was thinking slates the whole time I was working on the project, it just wasn’t possible to try the ideas in a slate form factor at the time. But that’s definitely where we intended to go with the research. And it’s where we still intend to go, using devices like the Asus EP121 to probe further ahead and see what other issues, techniques, or new possibilities arise. Because I’m still totally convinced that combined pen and touch is the way of the future. It might not happen now, or two years from now, or even five years from now– but the device of my dreams, the sleek devices that populate my vision of what we’ll be carrying around as the 21st century passes out of the sun-drenched days of its youth– well, they all have a fantastic user experience that incorporates both pen and touch, and everyone just expects things to work that way. Next week at the annual CHI 2010 Conference on Human Factors in Computing Systems, I’ll be presenting some new research that investigates the little-explored area of simultaneous pen and touch interaction. The future of direct interaction on displays is not about Touch. Likewise, it is not about the Pen. Nor is it about direct interaction on displays with Pen OR Touch. It is about Pen AND Touch, simultaneously, designed such that one complements the other. That is, we see pen and touch as complementary, not competitive, modalities of interaction. By leveraging people’s natural use of pen and paper, in the real world, we can design innovative new user experiences that exploit the combination of pen and multi-touch input to support non-physical yet natural and compelling interactions. I’ve now posted a video of the research on YouTube that shows a bunch of the techniques we explored. We have implemented these on the Microsoft Surface, using a special IR-emitting pen that we constructed. However, you can imagine this technology coming to laptops, tablets, and slates in the near future– the N-Trig hardware on the Dell-XT2, for example, already has this capability, although as a practical matter it is not currently possible to author applications that utlize simultaneous pen and touch; hence our exploration of the possibilities on the Microsoft Surface. The name, of course, is a simple pun on “Manual Dexterity” – in the context of shuffling papers and content on a “digital desk” in our case. Hence “manual deskterity” would be the metric of efficacy in paper-shuffling and other such activities of manual organization and arrangement of documents in your workspace. This name also has the virtue that it shot a blank on <name your favorite search engine>. Plus I have a weakness for unpronounceable neologisms.